If you know anything about my family, you know that we love food. Our conversations, weekend activities and even vacations are heavily food-centric. Last summer while living in Los Angeles for a bit, my family fell in love with food trucks. We had rented an apartment in Venice, where many food trucks park at a local bar, The Brig, on Abbot Kinney Boulevard. Not only was the food delicious and the prices reasonable, it was just fun eating dinner as we socialized with other patrons and enjoyed perfect California weather. Back home in Atlanta we were delighted to follow a new show on The Food Network, The Great Food Truck Race. A fun, adventurous reality tv show contest, The Great Food Truck Race was enthralling entertainment for my foodie family. We enjoyed watching the competition: the personalities, challenges and delicious looking food made for some good TV. So when we heard that season 2 of The Great Food Truck Race was underway and the current competitors were in Atlanta for the weekend, we made it our business to hunt down the trucks and help them in the race. There were 3 trucks left in the competition when they came to Atlanta: Hodge Podge, The Lime Truck and Roxy’s Grilled Cheese. We didn’t get a chance to try Hodge Podge, but we ate at The Lime Truck and Roxy’s Grilled Cheese on 2 different days. 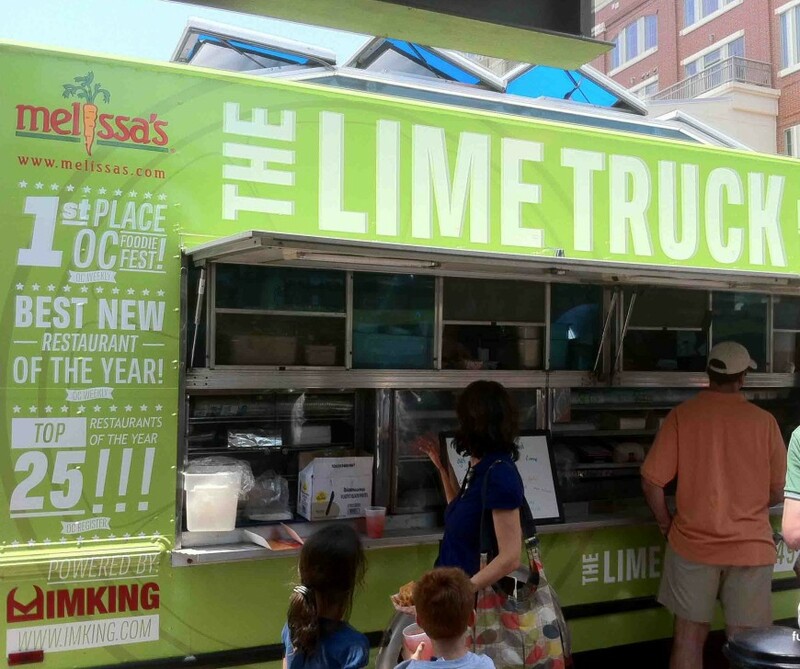 The Lime Truck was parked at Atlantic Station and even though we got there 10 minutes after the truck opened, the line was incredibly long. This was the second day for the trucks in Atlanta, so by now the word had gotten out and everyone wanted a taste. 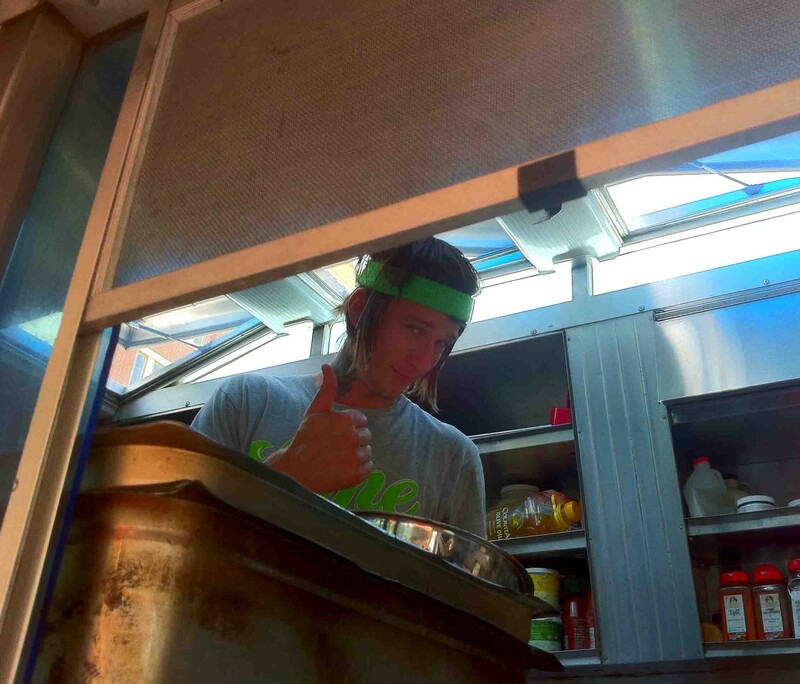 Also we found out that the challenge that day meant that the trucks were working with one less team member–that translated into slower food prep and slow-moving lines for the costumers. Thankfully Atlantic Station was kind enough to put umbrellas along the line because it was over 90 degrees that day. 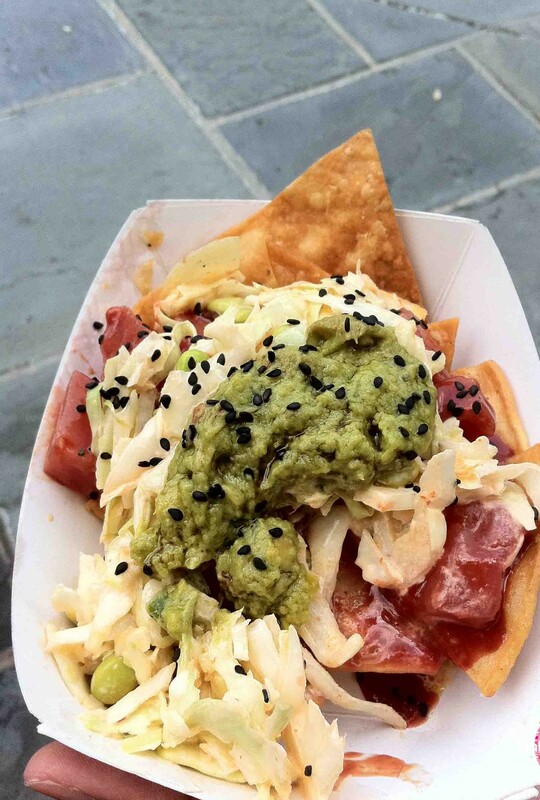 We settled on Ahi Tuna Poke Nachos, Ribeye Quesadilla, Blue Crab & Scallop Ceviche and Blood Orange Limeade. The ceviche was my personal favorite of all the choices; I didn’t taste the quesadilla and I didn’t like the nachos. Honestly the food overall was just not my thing, but my husband and son enjoyed everything we purchased and deemed The Lime Truck a success. 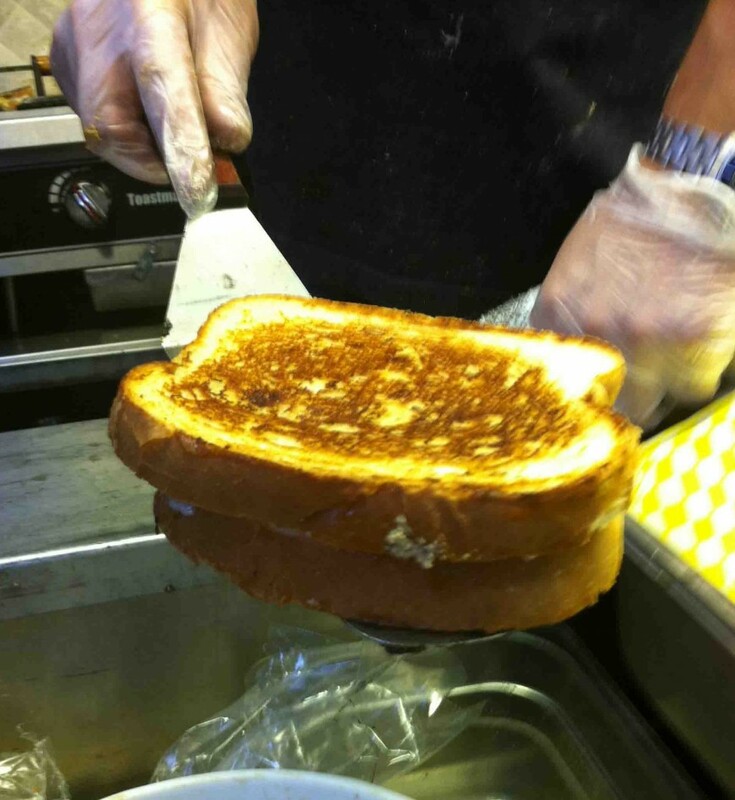 Of the two trucks we tasted during The Great Food Truck Race competition in Atlanta, Roxy’s Grilled Cheese was my favorite. At first we balked at the prices–food trucks are usually quite reasonable and $13 for a grilled cheese sandwich was outrageous–but since it was a competition (and we were hungry!) we stayed and ordered almost everything off the limited menu: a grilled cheese sandwich of private stock cheddar, foie gras, applewood bacon and peach preserve, a grilled cheese sandwich of Vermont cremont cheese, prosciutto de parma and quince, Maple Sweet Fries, Mascarpone Peach Brulee and Sweet Tea Arnold Palmer drinks. Both grilled cheese sandwiches were incredibly delicious and surprisingly big enough for my family of 4 to share. My husband didn’t care for the sandwich with Vermont cremont cheese because he doesn’t like stinky cheese, but the rest of us loved it. The sandwich with the foie gras was delectable and we all gobbled it down and fought over the last crumbs. The sweet potato fries were cooked to perfection and the maple sauce was a nice compliment. The Mascarpone Peach Brulee was my favorite! It was a creamy brulee with a light, fresh peachy flavor and the sugar crust was torched properly to a thin crunchy shell. Everyone in the family tasted a bit, but I tried to east most of it myself. My only regret is that we didn’t try the oysters; we talked to several people later who said that the oysters were fantastic. I hope Roxy’s did well during the weekend in Atlanta because the food was delicious. We heard that they had a rough go while parked at a obscure spot in Little Five Points and we found the truck near 12th and Peachtree–not the best location for maximum visibility. 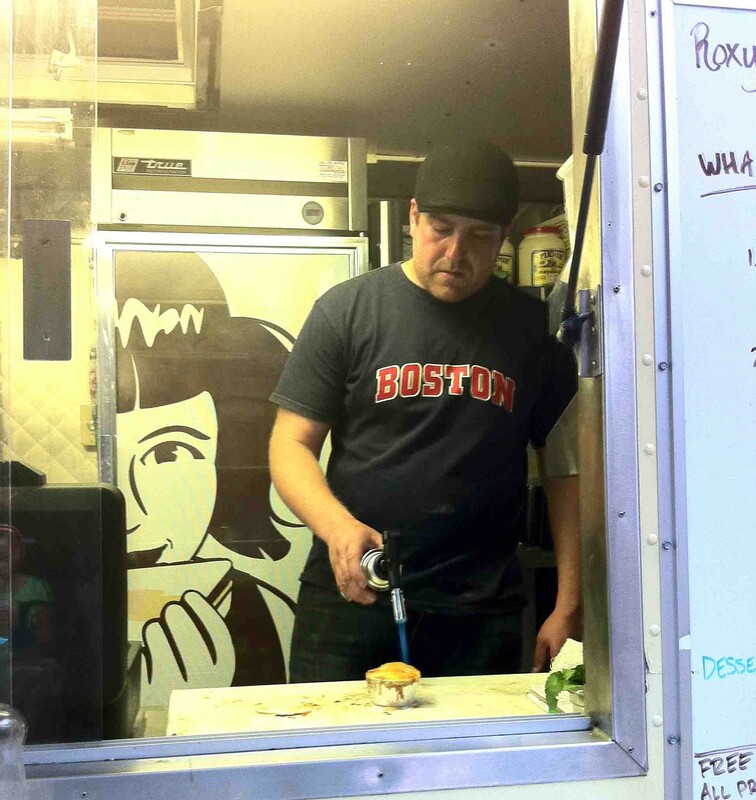 I guess we’ll find out when the new season of The Great Food Truck Race begins August 14th! *Look for me on the show; I was interviewed by the film crew after eating at Roxy’s. Hopefully my interview will make it on the show and not on the editing room floor :-)! P.S. You may also like to read about another food truck: Coolhaus Is The Best Ice Cream Sandwich In Los Angeles. First of all, you’re totally going to make it on the show. They’ll be smitten with your charm and good looks and wouldn’t dare leave you on the cutting room floor. Second of all, sounds like so much fun. We’re big foodies, too, but that’s one Food Network show we actually haven’t seen! Why thank you! You would enjoy the show; something the whole family could watch together. I love your blog, and the food truck thing is great. I had lots ideas for my free food friday idea. Thanks.